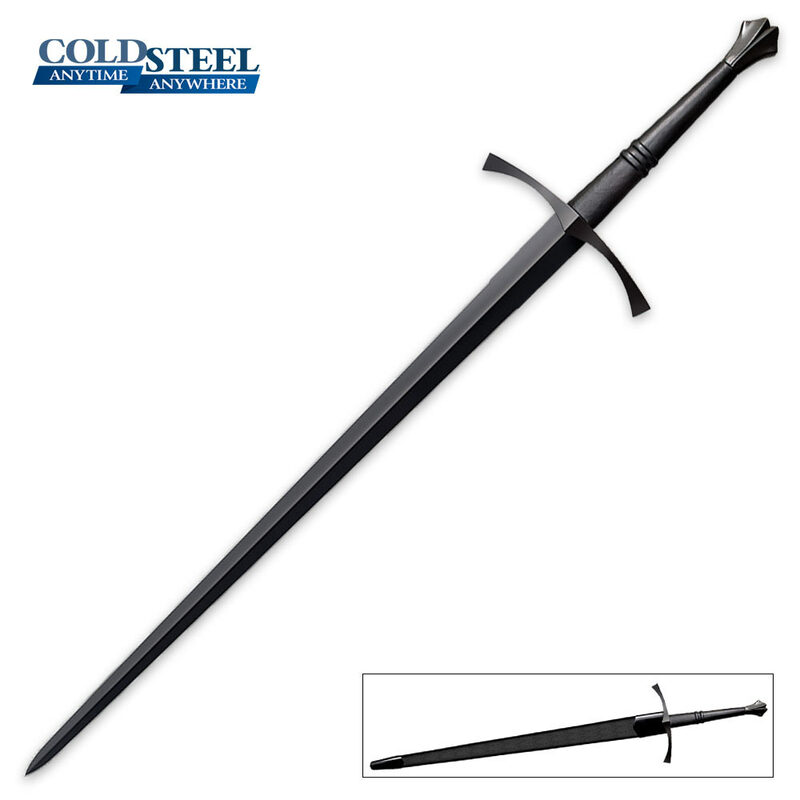 The Cold Steel Man At Arms (MAA) Italian Long sword is a force to be reckoned with. Forged by the most-talented sword makers on the planet at Cold Steel, this two handled sword features a 35 1/2" full sharpened 1090 carbon steel blade with a dark gun metal finish. Whether you are decapitating zombies or piercing car doors with this monstrous sword, you can bet it will not fail! Includes a leather scabbard with blued steel fittings. I was hopeful on this sword based on some research, the price and the reputation of Cold Steel, but you never really know until you see it. Well this exceeded all expectations! Impeccable quality, sharp, straight as an error, flawless finish, excellent balance (although I am much more used to a daito which I have practiced with for a long time). I cannot express enough that I am impressed with the quality and craftmanship of this sword. Cold Steel out did themselves. This is the sort of product that Budk should continue to carry. For those out there who are concerned about cost, you are getting a great value for this piece of art. If you want something that you can actually use, this is well worth it. It is functional and quite deadly. Impressed! Very Beautiful Sword. They make a silver version but its more expensive. Only difference is the MAA versions do not get polished until they shine, saving you some money. The strength and function is all the same. I often buy the MAA version to save money. Overall it is a long sword of 47inch. Could be used like a spear because the blade gets thinner all the way done to the end or could lob someone's head off with the length and power you get behind the chop with this sword. Another plus is it is light and easy to swing. Over all I love it!